For this mask, Toni wanted to create something that would deeply cleanse, draw out impurities and leave skin totally free of environmental aggression and stagnation. But I wanted it to also be healing, hydrating, softening and feel nurturing on your skin. UNMASK is not the typical Detox mask. It contains no traditional clays or powders. It doesn't need to be prepared. It doesn't dry on skin or need to be rehydrated in order to reactivate its healing, nourishing benefits. Instead, it's gorgeous texture glides over skin and gently sinks in. 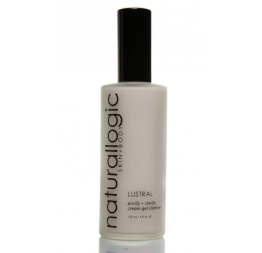 - nourishing oils hydrate, plump and moisturize skin. - follow with facial mist and serum. Use UNMASK either every day for 4 days, or every other day for a week, to gently but thoroughly purge skin and pores and restore it to deep pore purged equilibrium. Follow up 2-8 times a month for maintenance. ** This mask contains AHA's, and may cause redness or tingling, which will subside. If skin becomes too uncomfortable during use, remove immediately. Be sure to wear sun protection anytime you have sun exposure, for 24 hours following your masking time. Aloe Vera Juice*, Geranium Distillate**, Vegetable Glycerin, AHA Complex (Cane Sugar Extract*, Orange Peel Extract*, Lemon Peel*, Maple Sugar*, Bilberry*, Cranberry*), Activated Charcoal, Niacinamide (Vitamin B3), Castor Bean Oil*, Hemp Seed Oil*, Xanthan Gum, MSM (Methylsulfonylmethane), Honeysuckle Extract*, Chamomile Extract*, Willow Bark Extract* (standardized to 50% salicylic acid), Allantoin (from Comfrey), Leucidal Liquid (Radish Root Ferment Filtrate), Zeolite Clay, Calendula Extract*, Rosemary Oil CO2 Extract, Bergamot Oil, Orange Peel Oil, Clove Bud Oil, Lemongrass Oil, Jasmine Sambac Absolute.